Pieces of Me is the fifth studio album by American R&B singer–songwriter Ledisi released by Verve Forecast Records on June 14, 2011. The album debuted at number eight on the US Billboard 200, becoming her first US top-ten album on the chart, and her highest-selling album to date. It also saw similar success on the R&B/Hip-Hop Albums chart, where it debuted at number two, becoming her second top-ten album on that chart. The album was a critical and commercial success, earning Ledisi three Grammy–nominations at the 54th Grammy Awards, the title track (and US Top 20 R&B hit), "Pieces of Me" earned two nominations for Best R&B Song and Best R&B Performance, while the album itself received a nomination for Best R&B Album, losing to F.A.M.E. by Chris Brown. On March 10, 2011, during her opening act for singer Kem on the INTIMACY tour in Atlanta, Georgia. Ledisi has stated about her finishing recording her fifth studio album on the previous day. Her fans expected the album to hit the shelves during summer. "Pieces of Me", the album's title track, and lead single, was released in early summer of 2011, and has since peaked at number nineteen on the US R&B/Hip-Hop Charts. In September 2011, Ledisi released a video for her second single, "So Into You". The album was released on June 14, 2011. To promote the album, Ledisi signed CDs at a Wal-Mart in Memphis, Tennessee where she also performed as an opening act for Keri Hilson on the Road to Essence tour. She also performed in Birmingham, Alabama and Baton Rouge, Louisiana on June 15 and 16. To date, Pieces of Me sold over 270,000 copies in the US. Ledisi embarked on her first headlining tour, the Pieces of Me Tour in October through November 2011. Selling out venues across the country, the tour had 22 shows with Timothy Bloom as the opening act. 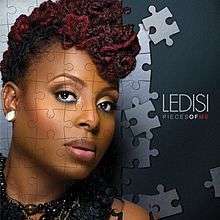 ↑ "iTunes - Music - Pieces of Me by Ledisi". Itunes.apple.com. 2011-06-14. Retrieved 2013-09-11. ↑ "Pieces of Me: Deluxe Edition (+2 Bonus Tracks): Music". Amazon.com. Retrieved 2013-09-11.